As many team members have been travelling to negotiate hardware supplies or participate in community events lately, we are taking this opportunity to give you an update on Librem laptop operations this month, while regular posts about the Librem phone are expected to resume in a week or two. Amidst the plethora of progress we blogged about recently on the mobile and security areas of our products, we also quietly achieved a very significant milestone in the life of our organisation, from the Inventory management and logistics standpoint: the ability to fulfill orders within 5 business days (on average), thanks to the inventory of Librem 13 and Librem 15 laptops we have built up. 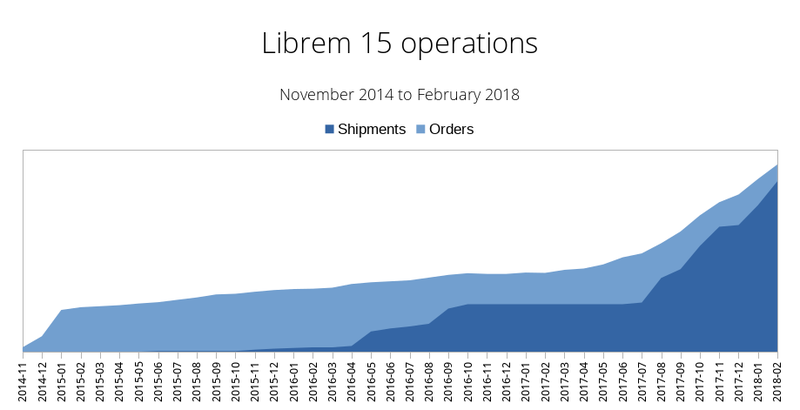 Note that the situation is even better than what the chart above indicates, as the remaining gap between orders and shipments of the Librem 15 actually represents orders from customers who have not decided what they want to do with their previous 4K order (we tried contacting those multiple times through email over the past few months and got no reply—if you are in this situation and have somehow not received emails from our ops department, please contact us with your existing order information). 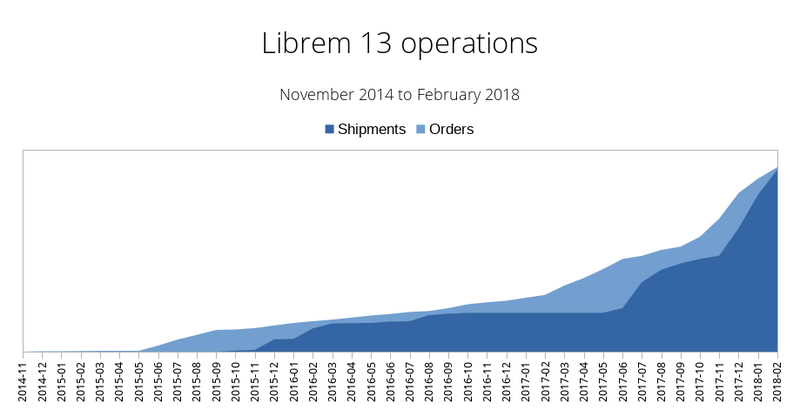 The Librem 13 was introduced five months after the Librem 15, which explains the chart data starting in May 2015. We have kept the X axis the same as for the Librem 15 for comparison purposes. The increased interest in our products is also the reason why we are now able to deliver worldwide with free shipping, and invest heavily in security by eating the cost of making TPM a standard feature on our laptop motherboards and advancing software that integrates with it, such as coreboot and Heads, where we are making significant contributions to those upstream projects, such as a menu interface for Heads or fixing various bugs in coreboot. Stay tuned for reverse engineering news in April! We would like to thank all our users of Librem laptops and FSF endorsed PureOS, as well as all those that have backed the Librem 5 phone, and of course all those people who support us by feedback, kind words (we were psyched to see many of you showing support and interest at our booth at LibrePlanet last week-end! ), and spreading the word. It is with this unified education approach that we can change the future of computing and digital rights for the better.